NORTH BAY, Ont. 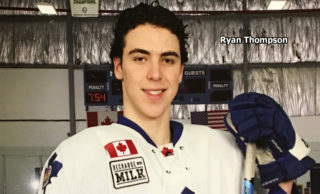 – The North Bay Battalion struck for five third-period goals, the first two shorthanded and the last three by Zach Bratina, in a 5-1 victory Thursday night over the Oshawa Generals that extended the Troops’ Ontario Hockey League winning streak to four games. Bratina added one assist for a four-point game, while Mike Amadio had one goal and two assists and Mark Shoemaker the other goal for the Battalion, which lost 5-0 at Oshawa on Sept. 27. Goaltender Jake Smith made 15 saves in recording his 64th career win, tying Bryan Pitton for the franchise record. The victory in the annual Pink in the Rink game in support of the Canadian Cancer Society moved North Bay’s won-lost-extended record to 4-3-0 for eight points, second in the Central Division, two points behind the Barrie Colts. Lukas Lofquist scored for the Generals, the reigning Memorial Cup champions, who are 4-4-1 for nine points, fourth in the East Division. Goaltender Liam Devine made 28 saves before 3,372 at Memorial Gardens. In its previous outing, Oshawa snapped a three-game losing streak with a 2-0 win Monday over the visiting Guelph Storm. Riley Bruce was off for tripping when the Battalion, which had trailed 1-0, finally solved Devine with a pair of shorthanded goals on the same penalty kill. Bratina broke in alone on Devine, who made a toe save at the left post, but Amadio followed up and chipped the rebound under the crossbar at 5:46 for his first goal of the season. Shoemaker scored the winner at 7:02, whipping the puck from the right-wing circle past Devine’s blocker on a two-on-one rush with Max Kislinger. The unassisted goal was defenceman Shoemaker’s first of the campaign. Bratina struck at 8:05, emerging from the left-wing corner to backhand the puck behind Devine from the lip of the crease. Amadio and Austin Kosack earned assists. The Troops made it 4-1 on the power play at 16:51 as the streaking Bratina took an Amadio pass that deflected off the raised stick of defender Sam Harding, darting in alone to beat Devine with a backhand deke. Cam Dineen had the second assist. Bratina ended the scoring at 19:59, charging to the net and slipping the puck between Devine’s legs while being hauled down by Jalen Smereck. Kosack claimed the lone assist on Bratina’s team-leading ninth goal, which, upon video review, was twice confirmed as having been scored before time expired. 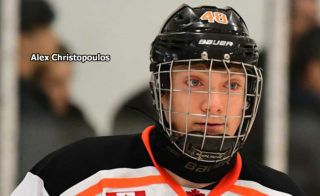 Bratina, who scored three goals in a 5-3 home-ice decision Monday over the Mississauga Steelheads, joined Luch Aquino and Cody Hodgson as the only players in franchise history to post consecutive three-goal games. Aquino did it on Feb. 19 and 23, 2006, while Hodgson accomplished the feat on Nov. 2 and 6, 2008. Lofquist opened the scoring at 13:31 of the first period, driving to the net to convert the rebound of Domenic Commisso’s shot from the right circle. Devine was tested several times among the 13 shots he faced in the frame. 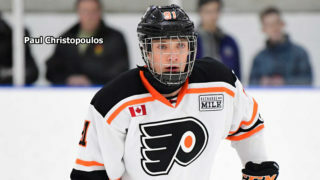 He stopped Zach Poirier’s shot off the right wing and Mike Baird’s attempt at the rebound in the fifth minute, got the blocker on a Kyle Potts drive in the sixth and kicked out an Amadio shot from in close in the eighth. Devine denied two Poirier attempts to convert a loose puck at the lip of the crease in the ninth minute and thwarted Zach Shanker on a nifty rush in the 18th. 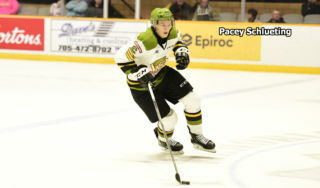 The Troops dominated the scoreless second period, outshooting Oshawa 12-7. Devine was busy early, sliding to deny Dineen on the rebound of a Kosack shot. The Battalion had a number of chances on two late power plays, but Devine made a sliding stop on Baird, found a Kosack point shot through a screen and turned away a Poirier threat from the right circle. Oshawa had some early chances, but Smith, who debuted new leg pads, each featuring half of the sergeant’s stripes prominent on Battalion sweaters, denied Jack Studnicka and Michael Dal Colle and got across to thwart Kenny Huether in the 10th minute. The Battalion visits the Sudbury Wolves at 7 p.m. Friday. The game can be heard live in North Bay on Country 600 CKAT. BATTALION BULLETS: Bratina, a Northern Ontario native born in Timmins, has a team-leading 10 points this season, including nine goals, two into empty nets, in the last four games … In 202 OHL games, Amadio has 43 goals and 90 assists for 133 points, tied with Scott Tanski for 20th place in Battalion history … Oshawa is the first opponent that the Troops have faced twice this season … The Battalion went 1-for-5 on the power play. The Generals were 0-for-3 … Opening line combinations included Amadio centring left winger Bratina and right winger Justin Brazeau, Brett McKenzie centring left winger Baird and Poirier on right wing and Potts skating between left winger Kislinger and right winger Brett Hargrave. 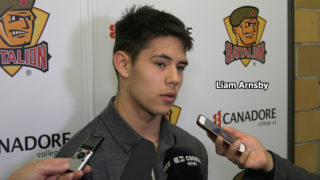 Brad Chenier centred left winger David Sherman and right winger Kyle Moore … Battalion scratches were Kyle Wood, Jake Ramalho, Jacob Ball, Brady Lyle, Mathew Santos and Calvin Gomes … Chenier made his OHL debut after being recalled from the Rayside-Balfour Canadians of the Northern Ontario Junior Hockey League for the game. 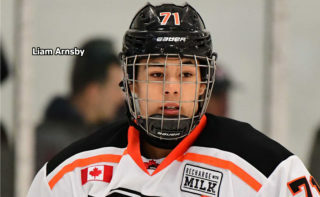 He was a fourth-round choice in the OHL Priority Selection last April … Ball has concussion-like symptoms after being checked into the boards during a 3-1 road win Saturday night over the Sault Ste. Marie Greyhounds … Santos completed a four-game suspension.